The floor plan of The Beech is an open plan that flows well. RALEIGH, N.C. - Oct. 8, 2018 - PRLog -- Every autumn, the Home Builders Associations of Raleigh-Wake County and Durham, Orange, & Chatham Counties host the Parade of Homes, a free-of-charge event that gives the public an opportunity to view the latest and greatest in new home design, construction, and technology in various price ranges in and around the Triangle. Legacy at Jordan Lake is pleased to be a participant this year with its model home, located at 66 Legacy Club Drive in Chapel Hill. The Parade event will take place October 6-7, 12-14, and 19-21, from noon till 5 pm… Consider this your personal invitation to Parade on over to Legacy! Designed and built by award-winning M/I Homes, "The Beech" is the Legacy model home/2018 Parade entry, consisting of 2,944 square feet. A plethora of details make The Beech a home you don't want to miss! 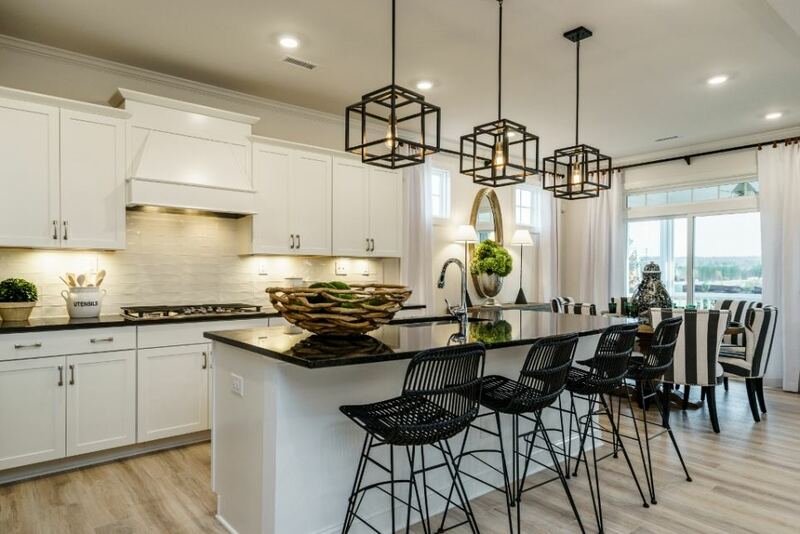 Just a few of the first floor features include a welcoming front porch, a dining room perfect for entertaining, a fantastic gourmet kitchen, and a grand family room. A wonderful screened porch and a guest room (or office; your choice) and full bath round out the first floor. Upstairs is home to a large loft, a marvelous owner's retreat, three additional bedrooms, two additional full baths, and a laundry room perfect for wash/fold duty. The Beech is third-party Energy Star certified, which means it delivers better quality, better comfort, and better durability when compared to other new homes. Also, The Beech, like all M/I homes, comes with a 15 year transferable structural warranty. As if all of this isn't enoughfor those of you that may be in the market for a new home, M/I Homes is participating in a "Dream Big!" National Sales Event through October 15th. This event allows home buyers two amazing ways to save on a new M/I home: 50% off designer upgrades on homes to be built, and a combo savings for quick move-in homes composed of the best prices of the year, an appliance package, and $5,000 paid in closing costs. "We are so excited our model home is in the Parade!" says Hollie McFarlin, M/I Homes' Onsite Agent at Legacy at Jordan Lake. "The floor plan of The Beech is very relatable to most of our guests; it's an open plan that flows well and is truly fresh and inviting. Black doors combined with a black and white color scheme tie in with natural fabrics and accessories. This correlates to the lifestyle that home owners enjoy here… Communing with nature via our trails, lake, and exciting outdoor amenities." "The National Sales Event only lasts until October 15th, so it aligns perfectly with the Parade," Hollie continues. "It's our best prices this year on quick move-in homes and offers great opportunities to personalize your new home if you have the time to build. In both cases, we'll help with the closing costs. These incentives are only available for a short period of time, so I encourage everyone interested to come see me soon!" Contact Hollie today to learn more about Legacy at Jordan Lake by calling (919) 337-9710 or by visiting The Beech, open daily (not just during the Parade! ), located at 66 Legacy Club Drive, Chapel Hill, NC. As we mentioned earlier, you're officially invited to Parade on over! M/I Homes, Inc. is one of the nation's leading builders of quality single-family homes, having delivered more than 100,000 homes since its foundation in 1976. The Company's innovative, award-winning homes are marketed and sold under the trade names M/I Homes and Showcase Homes. In addition to Cincinnati, the Company has homebuilding operations in Houston, Austin, San Antonio and Dallas/Fort Worth in Texas, Chicago, Illinois, Columbus and the Virginia and Maryland suburbs of Washington, D.C., Indianapolis, Indiana; Minneapolis/St. Paul, Minnesota, Tampa, Sarasota and Orlando, Florida; Charlotte and Raleigh, North Carolina. Legacy at Jordan Lake is a premier gated community bordering picturesque Jordan Lake in Chatham County. Homeowners enjoy a Chapel Hill address just minutes from Raleigh, Research Triangle Park,and Durham, with excellent schools, employment centers, shopping, and restaurants all easily accessible. Trails and streams, a clubhouse, an extensive amenities package, and lovely wooded homesites grace this 316-acre property, with some homesitesfeaturing horizon vistas and homes built by national builder M/I Homes. Roads have been designed to wind through the community's natural ridges, giving the property a mountain-like feel, especially on ridge tops that feature magnificent panoramas of 15 – 20 miles. Visit legacyjordanlake.com to learn more.